If you want to keep your natural teeth well into your old age, good dental hygiene is important. But given how rushed our mornings and evenings often are, we don’t always brush our teeth with the kind of diligence necessary to avoid the dentist’s drill. That’s the problem the new Kolibree electric toothbrush, unveiled at CES 2015, aims to solve – it connects directly to your smartphone device via Bluetooth to help coach your family on proper brushing techniques. What makes the Kolibree toothbrush special are its 3D (9-axis) motion sensors that keep track of its position in your mouth as it vibrates to help clean. It knows what teeth you’re brushing, and just as importantly, what teeth you didn’t spend enough time cleaning. You can view this information on the Kolibree mobile app (iOS and Android), along with daily historical data on your brushing frequency and duration. The app also provides tips from dental professionals on how to keep your teeth and gums healthy. Beyond those softer vibrations, the lightweight Kolibree is great for kids because it offers the option to turn brushing time into an interactive game. In Go! Pirate, for example, the positioning of the toothbrush in your child’s mouth will control the position of an in-game character as he attempts to collect coins. The game is designed to motivate kids into becoming proficient brushers, as that’s the only way to achieve the highest score. Each Kolibree comes with the main toothbrush unit, two brush heads and a rechargeable base. The battery lasts about a week on a single charge, though you’ll need to recharge much more frequently if you have a larger family. 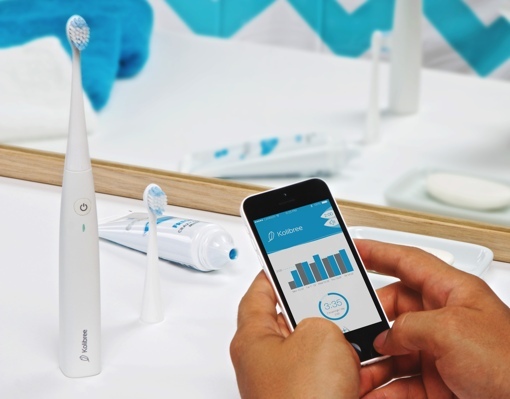 The Kolibree connected electric toothbrush will be available in the U.S. in January 2015. It will retail for $199. Replacement brush heads will also be available for purchase. To learn more, visit the Kolibree website.